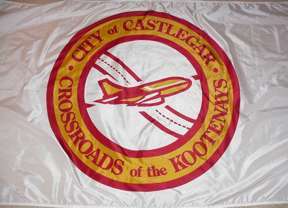 The flag of Castlegar, BC, features a castle in the center which reflects the community’s status as a center of commercial activity in the west Kootenay region. The wavy lines represent the convergence of the Kootenay and Columbia rivers. Another flag bearing an airplane and highway crossing over each other inside a red-lined gold ring on a white field has also been reported.